I have had the opportunity to try out the My Memories Suite Digital Scrapbooking Software, a $39.97 value. First I would like to share with you all my experience with this software along with a few thing I created for fun. Then I will talk about the giveaway some more! My Memories doesn't only sell scrapbooking software, they offer wedding related software such as MyMemories Wedding Studio. They also have a professional photo book software called MyMemories Photobook Studio. First I wanted to try creating something using one of the many templates they provided. I chose one of the classic ones to show you how simple yet cute something can be. 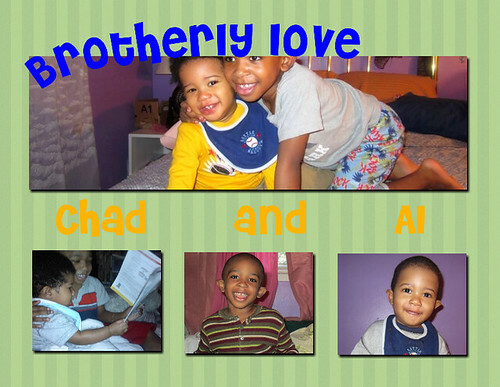 I basically only added a few pictures and added text on the top and the "brotherly love" text. The fonts I used were fonts that I have previously installed on my computer for other reasons. I used one of the pre-installed backgrounds provide by the software to add a cute neutral stripe background. I think it came out simple yet adorable. I am truly considering developing this or printing it out, haven't decided which is better yet, then giving it to my aunt as a gift. This software is easy to use. They provide so many great templates that's included in the software for you to use. You can also purchase other templates on their website for a low cost. My Memories Suite also allows you to create a memories from scratch, using NO templates, and just your imagination. It's great for something that has a lot of photos they want to put into a album but just hates boring looking albums. Why not just CUSTOMIZE IT and make it your own?!! If you wish to purchase the My Memories Suite Scrapbooking Software you can use my personal coupon code, STMMMS95215, for $10 OFF your order, only valid for the My Memories Suit v3. It' the same software that I will be talking about all throughout this post. Check out their social networking sites. Disclaimer: This is a sponsored review, I may or may not gain compensation through my coupon code. This does not influence my opinions my any means. My reviews are ALWAYS honest. This scrapbook is such a wonderful idea. I love scrapbooking myself, I really need to get back into it.